Thank you for volunteering with Theatre Oxford! Please sign up for whatever interests you. No experience is required. We are happy to train you. Part of our mission is education! 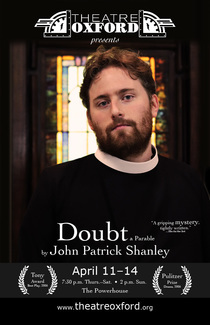 As a thank-you, for each slot you sign up for, you will receive one free ticket to a Doubt performance of your choice. You can learn more about the play here. See you soon! Great for friendly people who can sit a while. May miss first part of show (so you may want to see the show on a separate day). Must be 21 or older. (May pour wine.) May miss a bit of the show at the beginning and after intermission.